Arlington's TVBU507 Arlington's Recessed Two-Gang TV Box for new or old work allows you to mount LCD and plasma TV's and other system components flush against the wall. The box offers power and low voltage for Class 2 wiring of satellite or cable TV, speakers, etc. 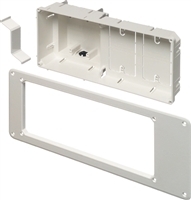 Arlington's TVB613 Arlington-s recessed TV BOX for new or old work allows LCD and plasma TVs to be placed flush against the wall. Its double-gang, combo box design allows you to install two duplex (power) receptacles or you can use the box separator to install one low voltage device and one power duplex receptacle. There are also two additional built-in mounts for low voltage, data/media connections like speakers, satellite TV, surround-sound, etc. 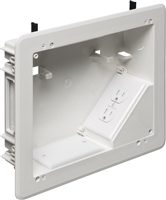 Arlington's TVB712 plastic recessed combination power and low voltage TV BOX™ offers the secure, easy way to mount flat-screen TVs flush against a wall. Designed for new or old work, our TVB712 and TVB713 boxes have angled outlet boxes that take convenience to a new level. The versatile TVB712 offers power and/or low voltage. Our larger TVB713 has two angled outlet boxes that keep plugs behind the wall surface - and allow for the use of the new close-clearance TV mounting hardware. Now you really can mount a TV flush against a wall. 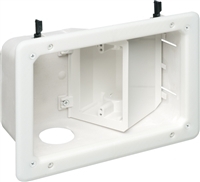 Arlington's TVL508 low profile 5" x 8" TV BOX™ is ideal for flat screen TV installations on 1/2" or 5/8" drywall with wall cavity depths 3/4" and larger. The low profile box is also helpful when plumbing or other obstructions run within the wall cavity. It has lots of room inside for multiple cables and brackets for tying them off - keeping the installation neat and organized. Dimensions: 5" x 8" x 1-1/4"
Arlington's TVB713 plastic recessed combination power and low voltage TV BOX™ offers the secure, easy way to mount flat-screen TVs flush against a wall. Designed for new or old work, our TVB712 and TVB713 boxes have angled outlet boxes that take convenience to a new level. Arlington's TVB810 TV Box delivers the ultimate in versatility for installing wall-mounted TVs. There's more room in the box for wires. And, you can install it horizontally or vertically to ensure proper positioning of low voltage connections behind the TV. TVB810 is ideal for home theater systems where multiple connections are needed for sound systems, satellite TV, cable TV, DVRs, and more. Arlington's TVBRA3K new non-metallic TV Bridge includes two recessed power/low voltage combo boxes and all the connections you need (except for the NM cable) to install a flat screen TV in an existing wall. The best part is there's no need to run cable from a panel box - or cut holes in your framing members. Just cut two holes in the wall and access power from an existing, nearby source. Arlington's TVBRA1K Arlington's new non-metallic TV Bridge II box kits are the easiest, fastest way to install a flat screen TV. They include two boxes and the necessary connections needed to install the TV and additional components. Installation is faster because we've done the advance assembly work for you! You'll get a fully assembled, recessed box, with pre-wired receptacle, device, flexible cord and cord grip. All you need to do is cut two openings in the wall, near a power source. There's no need to cut into your framing members or run power from a panel box. Arlington's TVBRA3K new non-metallic 2-Gang Upper 1-Gang Lower TV Bridge II Kit are the easiest, fastest way to install a flat screen TV. They include two boxes and the necessary connections needed to install the TV and additional components. Installation is faster because we've done the advance assembly work for you! You'll get a fully assembled, recessed box, with pre-wired receptacle, device, flexible cord and cord grip. All you need to do is cut two openings in the wall, near a power source. There's no need to cut into your framing members or run power from a panel box. Arlington's TVBRA2K Arlington's new non-metallic TV Bridge II box kits are the easiest, fastest way to install a flat screen TV. They include two boxes and the necessary connections needed to install the TV and additional components. Installation is faster because we've done the advance assembly work for you! You'll get a fully assembled, recessed box, with pre-wired receptacle, device, flexible cord and cord grip. All you need to do is cut two openings in the wall, near a power source. There's no need to cut into your framing members or run power from a panel box.